The Piano Album, was recorded in November of 1976. These ten gorgeous tunes were put together in an attempt by John to gain a record contract following his break with RCA. 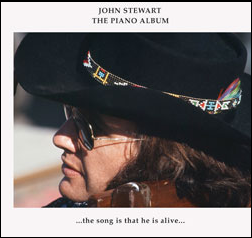 The official title is John Stewart -- The Piano Album ... "The Song Is That He Is Alive" a lyric taken from the "Zapata" cut on the album. This CD is the real deal. John at the peak of his powers, playing acoustic guitar and piano, singing his keester off on ten of his original songs, with the World's Loudest Folk Band ('to be' at that point, late '76) backing him in the studio -- Joey Harris (and his fabulous and identifiable guitar leads), Chris Whalen on bass, and Peter Thomas on drums. We feel strongly enough about the quality and feel of this album to make it the lead-off product out of The Box. It is a special and magic collection. It has been remixed beautifully, with a straight-from-the-master sound.We guarantee you will not be disappointed. And if you have heard any of these songs in other and lesser forms, you have no idea of the power of them until you hear them as they were intended -- by John -- to be heard.